G.B. 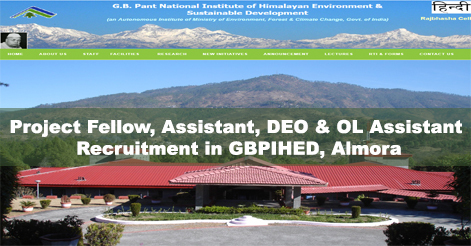 Pant National Institute of Himalayan Environment & Sustainable Development (GBPIHED), Almora has released the advertisement for the recruitment of Junior Research / Project Fellow, Field Assistant, Data Entry Operator, Project Assistant and Official Language Assistant for the various projects. These posts are on contractual basis. Department invites candidates for Walk in Interview on 02nd August 2018. Junior Project Fellow (01) 1st Class M.Sc. in Geography/Remote Sensing GIS / Physics /Hydrology/ Water Resource management /Environmental Sc. 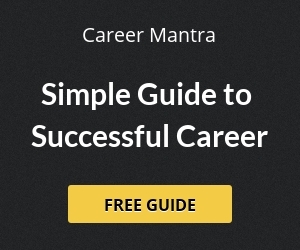 Good knowledge of any of the programming Software, such as R, Fortran, Mat Lab, etc. First Class B.E. or B. Tech in Agricultural Engineering / Soil & Water conservation engineering / Environmental Engineering. (i) Some experience in writing research reports, dissertation reports, PRA exercises etc. (ii) Understanding and knowledge of data handling, compilation, and computers etc. Rs. 25,000/- + HRA per month for NET (JRF) qualified. ENVIS Centre on Himalayan Ecology (MOEF&CC, Govt. of India). Graduation Degree with English or Hindi as Subject. Interested candidates may appear in walk-in Interview on 02nd August 2018 at 10:00 am onwards at Koshi-Katarmal (Almora) campus of the Institute. Desirous candidate may forward an advance copy of the application to the Administrative Officer by e-mail (os@gbpihed.nic.in) clearly mentioning the position applied for. Candidates are requested to bring their original certificates of educational qualification, experience certificate and one set of self-attested photocopies of all the documents, updated bio-data (having personal details like Name, Father’s Name, Date of Birth, Address, Contact No., e-mail Id etc. ), publications etc. along with an application. Walk-in Interview Date: 02 August 2018 at 10:00 am onwards. Help us to improve this article/job posting "Walk-in for Project Fellow, Field Assistant, DEO and OL Assistant post in GBPIHED, Almora". We would be glad if you can comment below and provide your valuable suggestions and feedback. If this page have any wrong information/list or out of context content, then you can report us as well. my typing speed 65 wpm and Hindi 35 wpm. So can I come tomorrow to give an interview .